Fun activities for people with no friends aren’t possible to happen. Some people believe that in order to have a fun day or especially some fun activities, it takes two or more to make it fun. Have you ever heard a proverb of it takes two to tango? It works similar to that proverb. In making something works in balance, people have to socialize with others so that they can turn their dull day to be a fun day. It would be a different story when someone has been born as an introvert. An introvert is unable to socialize with others. That is certainly why they have to spend their time by themselves. It has later been a habit of doing everything alone. Then what should the introverts do to spend their fun holiday? When you get to see the beauty of the world, you don’t need other people to experience it. You can enjoy it by yourself in different perspectives. Indeed, going with friends can fill the emptiness you have but when you are hanging out with them you will put aside the beauty of the place because the one you are thinking is taking a lot of photos then upload it in your social media. If you choose traveling around the world alone, you might face the risk by yourself but trust me it is going to be totally worth to see. Doing yoga means that you are getting to know your body much better. By knowing your body well, you will have more confidence because you have been dealing with your body and your body will work based on what you want it to be. You will have brighter skin, different personality, and also happier mood afterwards. Believe me, when you have been feeling opened to your heart, your mind and soul will reflect your fresher life through your skin and face tone. Nobody needs a friend while they are reading a book. In reading a book, silence is needed because they need to concern on what they are reading. Those excerpts, citation, statements, and meaning behind those words are the essential things you need to observe when you are reading. When nobody wants to befriend with you, you have books out there. You can gain your knowledge and skills so that in the end you will get to know and make more friends because you have the plus points that other people don’t have. Having no friend doesn’t always mean that you are alone. There are still loads of things you can do passionately in order to spend time and make your life more meaningful (read also: how to be happy without friends). You can do something different from the usual such as cooking, going in a concert, horse riding, mountain climbing, or anything. It is just something that is out of the box. 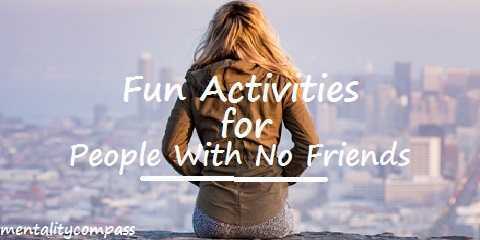 In conclusion, when you feel that you are all alone and no one wants to be close to you, you can still do these fun activities for people with no friends.